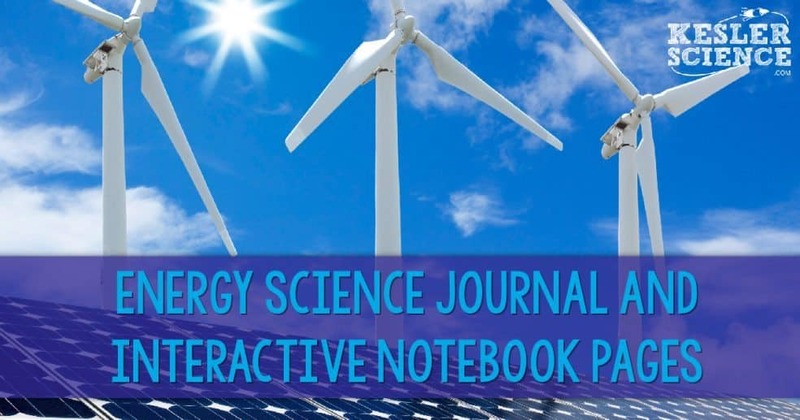 I’m super excited about my latest Energy for Interactive Notebook Pages templates. 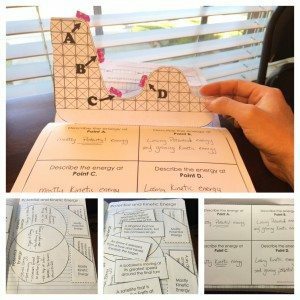 I was able to branch out from some of my other templates and include some activities that are truly one of a kind. The first concept we cover when talking about energy is potential and kinetic energy. This concept is heavily tested in Texas, and luckily it’s one students usually don’t have too much of a problem with. I’ve included a Venn diagram which allows students to compare and contrast potential and kinetic energy. I’ve also added a card sort activity that can be glued directly into the science journal. There are 12 cards with descriptions of potential or kinetic energy situations. I’m most proud of the interactive flip book which allows students to describe the potential and kinetic energy of a roller coaster. It turned out really great, and looks excellent in an interactive notebook. Students are also asked to draw a picture of a situation that contains both potential and kinetic energy. The next part of the notebook focuses on heat transformations in the form of conduction, convection, and radiation. I have included a flippable where students can capture the definitions of each. I also have them draw a picture of each different type of heat transformation on the underside of the flippable. The interactive pyramid allows them to take notes over conduction, convection and radiation. You could supplement this out for the other template or use it to create lists of examples of conduction, convection and radiation. 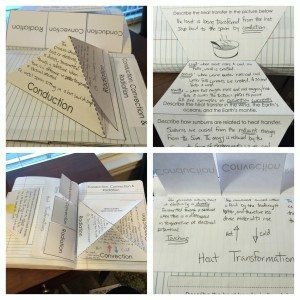 Lastly, there is an accordion pull out that asks students to explain the given heat transfers using the three types of heat transformations. I created a specially designed energy transformations activity for these notebook pages. The activity allows students to manipulate the energy transformations of 10 different energy situations. It includes a pocket for the strips when the activity is not in use. 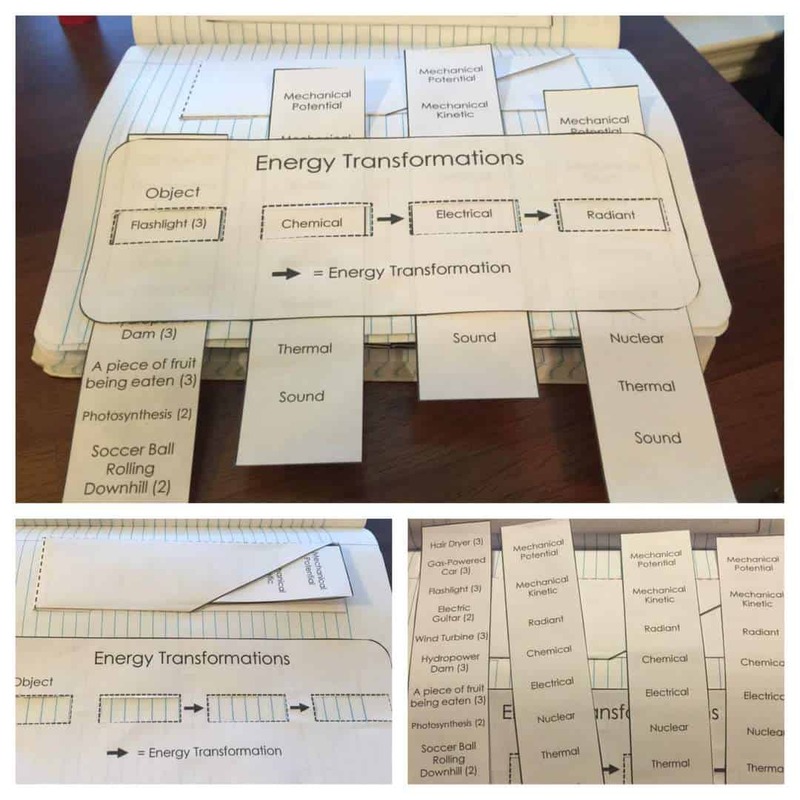 Students will select which situation they will try to figure out and then slide the 3 other manipulatives to come up with the correct energy transformation. Take a look at the video below to see how it works. The next activity is an energy types pull-out. This one covers the following energy types: Mechanical Potential, Mechanical Kinetic, Radiant, Chemical, Electrical, Nuclear, Thermal, and Sound. 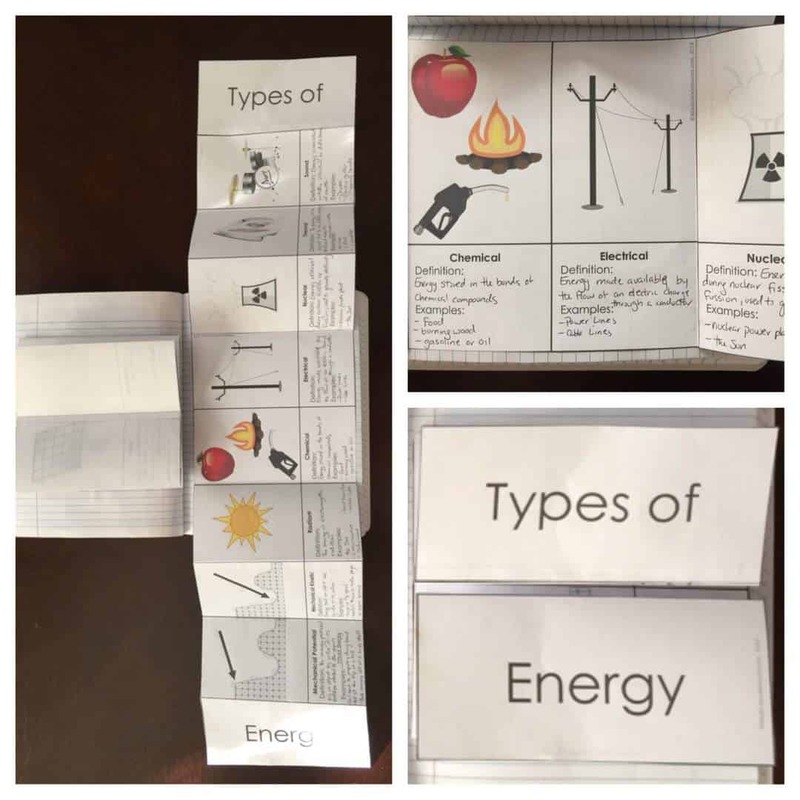 Students are asked to describe the energy type and provide examples of each. I have included three different variations of this template. One is in color with pictures, one is black and white with pictures, and one has no pictures at all. I have also include blank panels in case you wanted to add your own energy types. Lastly, I use another fold-out to talk about the advantages and disadvantages of different forms of energy. The energy forms that are included in the fold out are Coal, Oil, Natural Gas, Nuclear Power, Biomass, Wind, Hydropower, Geothermal, and Solar. 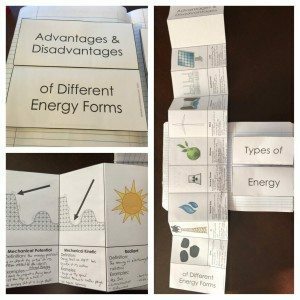 Students have to research the advantages and disadvantages of each of these forms of energy. Again, these come in 3 variations: color with picutres, black and white with pictures, and one with no pictures at all. Blank panels are also included if you want to tailor it to your class. These energy templates can all be downloaded here.